Index ( IND is 0x84). Next Line ( NEL is 0x85). Tab Set ( HTS is 0x88). Reverse Index ( RI is 0x8d). Single Shift Select of G2 Character Set ( SS2 is 0x8e). This affects next character only. 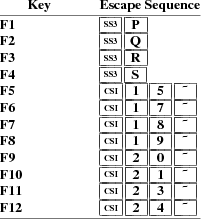 Single Shift Select of G3 Character Set ( SS3 is 0x8f). This affects next character only. Device Control String ( DCS is 0x90). Start of Guarded Area ( SPA is 0x96). End of Guarded Area ( EPA is 0x97). Start of String ( SOS is 0x98). Control Sequence Introducer ( CSI is 0x9b). String Terminator ( ST is 0x9c). Operating System Command ( OSC is 0x9d). Privacy Message ( PM is 0x9e). Application Program Command ( APC is 0x9f). Most of these control sequences are standard VT102 control sequences, but there is support for later DEC VT terminals (i.e., VT220, VT320, VT420), as well as ISO 6429 and aixterm color controls. The only VT102 feature not supported is auto-repeat, since the only way X provides for this will affect all windows. There are additional control sequences to provide xterm-dependent functions, such as the scrollbar or window size. Where the function is specified by DEC or ISO 6429, the code assigned to it is given in parentheses. The escape codes to designate and invoke character sets are specified by ISO 2022; see that document for a discussion of character sets. Form Feed or New Page (NP). Ctrl-L is treated the same as LF. Line Feed or New Line (NL). (LF is Ctrl-J). Shift In (Ctrl-O) → Switch to Standard Character Set. This invokes the G0 character set (the default). Shift Out (Ctrl-N) → Switch to Alternate Character Set. This invokes the G1 character set. Vertical Tab (Ctrl-K). This is treated the same as LF. This excludes controls where ESC is part of a 7-bit equivalent to 8-bit C1 controls, ordered by the final character(s). DEC double-height line, top half (DECDHL). DEC double-height line, bottom half (DECDHL). DEC Screen Alignment Test (DECALN). Select default character set. That is ISO 8859-1 (ISO 2022). Select UTF-8 character set (ISO 2022). Designate G0 Character Set (ISO 2022, VT100). C = 0 → DEC Special Character and Line Drawing Set. C = A → United Kingdom (UK). C = B → United States (USASCII). C = 4 → Dutch. C = C or 5 → Finnish. C = R → French. C = Q → French Canadian. C = K → German. C = Y → Italian. C = E or 6 → Norwegian/Danish. C = Z → Spanish. C = H or 7 → Swedish. C = = → Swiss. Designate G1 Character Set (ISO 2022, VT100). The same character sets apply as for ESC ( C.
Designate G2 Character Set (ISO 2022, VT220). Designate G3 Character Set (ISO 2022, VT220). Designate G1 Character Set (VT300). Designate G2 Character Set (VT300). Designate G3 Character Set (VT300). These work for 96-character sets only. C = A → ISO Latin-1 Supplemental. Back Index (DECBI), VT420 and up. Forward Index (DECFI), VT420 and up. Cursor to lower left corner of screen. This is enabled by the hpLowerleftBugCompat resource. Memory Unlock (per HP terminals). None. xterm implements no APC functions; P t is ignored. P t need not be printable characters. P s = 0 → Clear all UDK definitions before starting (default). P s = 1 → Erase Below (default). P s = 0 ← Lock the keys (default). P s = 1 ← Do not lock. Set Termcap/Terminfo Data (xterm, experimental). The string following the "p" is a name to use for retrieving data from the terminal database. The data will be used for the "tcap" keyboard configuration’s function- and special-keys, as well as by the Request Termcap/Terminfo String control. Two special features are also recognized, which are not key names: Co for termcap colors (or colors for terminfo colors), and TN for termcap name (or name for terminfo name). Insert P s (Blank) Character(s) (default = 1) (ICH). Cursor Up P s Times (default = 1) (CUU). Cursor Down P s Times (default = 1) (CUD). Cursor Forward P s Times (default = 1) (CUF). Cursor Backward P s Times (default = 1) (CUB). Cursor Next Line P s Times (default = 1) (CNL). Cursor Preceding Line P s Times (default = 1) (CPL). Cursor Character Absolute [column] (default = [row,1]) (CHA). Cursor Position [row;column] (default = [1,1]) (CUP). Cursor Forward Tabulation P s tab stops (default = 1) (CHT). P s = 0 → Erase Below (default). P s = 1 → Erase Above. P s = 2 → Erase All. P s = 3 → Erase Saved Lines (xterm). P s = 0 → Selective Erase Below (default). P s = 1 → Selective Erase Above. P s = 2 → Selective Erase All. P s = 0 → Erase to Right (default). P s = 1 → Erase to Left. P s = 0 → Selective Erase to Right (default). P s = 1 → Selective Erase to Left. Insert P s Line(s) (default = 1) (IL). Delete P s Line(s) (default = 1) (DL). Delete P s Character(s) (default = 1) (DCH). Scroll up P s lines (default = 1) (SU). Scroll down P s lines (default = 1) (SD). Reset one or more features of the title modes to the default value. Normally, "reset" disables the feature. It is possible to disable the ability to reset features by compiling a different default for the title modes into xterm. P s = 0 → Do not set window/icon labels using hexadecimal. P s = 1 → Do not query window/icon labels using hexadecimal. P s = 2 → Do not set window/icon labels using UTF-8. P s = 3 → Do not query window/icon labels using UTF-8. (See discussion of "Title Modes"). Erase P s Character(s) (default = 1) (ECH). Cursor Backward Tabulation P s tab stops (default = 1) (CBT). Character Position Absolute [column] (default = [row,1]) (HPA). Repeat the preceding graphic character P s times (REP). Send Device Attributes (Primary DA). P s = 1 → 132-columns. P s = 2 → Printer. P s = 6 → Selective erase. 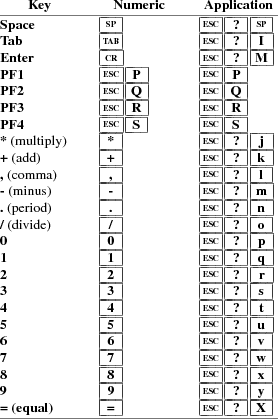 P s = 8 → User-defined keys. P s = 9 → National replacement character sets. P s = 1 5 → Technical characters. P s = 2 2 → ANSI color, e.g., VT525. 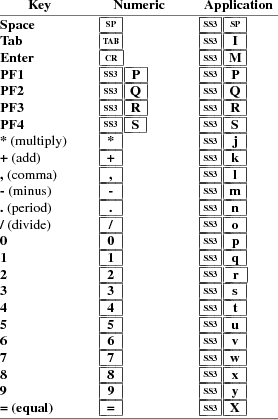 P s = 2 9 → ANSI text locator (i.e., DEC Locator mode). Send Device Attributes (Secondary DA). P p = 0 → ‘‘VT100’’. P p = 1 → ‘‘VT220’’. and P v is the firmware version (for xterm, this was originally the XFree86 patch number, starting with 95). In a DEC terminal, P c indicates the ROM cartridge registration number and is always zero. Line Position Absolute [row] (default = [1,column]) (VPA). Horizontal and Vertical Position [row;column] (default = [1,1]) (HVP). P s = 0 → Clear Current Column (default). P s = 3 → Clear All. P s = 2 → Keyboard Action Mode (AM). P s = 4 → Insert Mode (IRM). P s = 1 2 → Send/receive (SRM). P s = 2 0 → Automatic Newline (LNM). DEC Private Mode Set (DECSET). 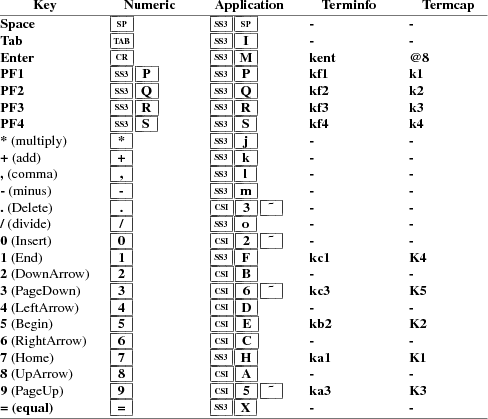 P s = 1 → Application Cursor Keys (DECCKM). P s = 3 → 132 Column Mode (DECCOLM). P s = 4 → Smooth (Slow) Scroll (DECSCLM). P s = 5 → Reverse Video (DECSCNM). P s = 6 → Origin Mode (DECOM). P s = 7 → Wraparound Mode (DECAWM). P s = 8 → Auto-repeat Keys (DECARM). P s = 1 0 → Show toolbar (rxvt). P s = 1 2 → Start Blinking Cursor (att610). P s = 1 8 → Print form feed (DECPFF). P s = 1 9 → Set print extent to full screen (DECPEX). P s = 2 5 → Show Cursor (DECTCEM). P s = 3 8 → Enter Tektronix Mode (DECTEK). P s = 4 0 → Allow 80 → 132 Mode. P s = 4 1 → more(1) fix (see curses resource). P s = 4 2 → Enable Nation Replacement Character sets (DECNRCM). P s = 4 4 → Turn On Margin Bell. P s = 4 5 → Reverse-wraparound Mode. P s = 4 6 → Start Logging. This is normally disabled by a compile-time option. P s = 4 7 → Use Alternate Screen Buffer. (This may be disabled by the titeInhibit resource). P s = 6 6 → Application keypad (DECNKM). P s = 6 7 → Backarrow key sends backspace (DECBKM). P s = 1 0 0 4 → Send FocusIn/FocusOut events. P s = 1 0 0 5 → Enable Extended Mouse Mode. P s = 1 0 3 4 → Interpret "meta" key, sets eighth bit. (enables the eightBitInput resource). P s = 1 0 3 5 → Enable special modifiers for Alt and NumLock keys. (This enables the numLock resource). 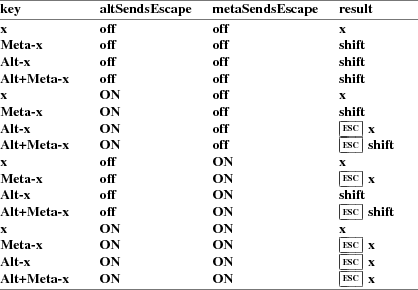 P s = 1 0 3 6 → Send ESC when Meta modifies a key. (This enables the metaSendsEscape resource). P s = 1 0 3 7 → Send DEL from the editing-keypad Delete key. P s = 1 0 3 9 → Send ESC when Alt modifies a key. (This enables the altSendsEscape resource). P s = 1 0 4 0 → Keep selection even if not highlighted. (This enables the keepSelection resource). P s = 1 0 4 1 → Use the CLIPBOARD selection. (This enables the selectToClipboard resource). P s = 1 0 4 2 → Enable Urgency window manager hint when Control-G is received. (This enables the bellIsUrgent resource). P s = 1 0 4 3 → Enable raising of the window when Control-G is received. (enables the popOnBell resource). P s = 1 0 4 7 → Use Alternate Screen Buffer. (This may be disabled by the titeInhibit resource). P s = 1 0 4 8 → Save cursor as in DECSC. (This may be disabled by the titeInhibit resource). P s = 1 0 4 9 → Save cursor as in DECSC and use Alternate Screen Buffer, clearing it first. (This may be disabled by the titeInhibit resource). This combines the effects of the 1 0 4 7 and 1 0 4 8 modes. Use this with terminfo-based applications rather than the 4 7 mode. P s = 1 0 5 0 → Set terminfo/termcap function-key mode. P s = 1 0 6 1 → Set VT220 keyboard emulation. P s = 0 → Print screen (default). P s = 4 → Turn off printer controller mode. P s = 5 → Turn on printer controller mode. P s = 1 → Print line containing cursor. P s = 4 → Turn off autoprint mode. P s = 5 → Turn on autoprint mode. P s = 1 0 → Print composed display, ignores DECPEX. P s = 1 1 → Print all pages. P s = 4 → Replace Mode (IRM). P s = 2 0 → Normal Linefeed (LNM). DEC Private Mode Reset (DECRST). P s = 1 → Normal Cursor Keys (DECCKM). P s = 3 → 80 Column Mode (DECCOLM). P s = 4 → Jump (Fast) Scroll (DECSCLM). P s = 5 → Normal Video (DECSCNM). P s = 6 → Normal Cursor Mode (DECOM). P s = 7 → No Wraparound Mode (DECAWM). P s = 8 → No Auto-repeat Keys (DECARM). P s = 9 → Don’t send Mouse X & Y on button press. P s = 1 0 → Hide toolbar (rxvt). P s = 1 2 → Stop Blinking Cursor (att610). P s = 1 8 → Don’t print form feed (DECPFF). P s = 1 9 → Limit print to scrolling region (DECPEX). P s = 2 5 → Hide Cursor (DECTCEM). P s = 4 0 → Disallow 80 → 132 Mode. P s = 4 1 → No more(1) fix (see curses resource). P s = 4 2 → Disable Nation Replacement Character sets (DECNRCM). P s = 4 4 → Turn Off Margin Bell. P s = 4 5 → No Reverse-wraparound Mode. P s = 4 6 → Stop Logging. (This is normally disabled by a compile-time option). P s = 4 7 → Use Normal Screen Buffer. P s = 6 6 → Numeric keypad (DECNKM). P s = 6 7 → Backarrow key sends delete (DECBKM). P s = 1 0 0 1 → Don’t use Hilite Mouse Tracking. P s = 1 0 0 2 → Don’t use Cell Motion Mouse Tracking. P s = 1 0 0 3 → Don’t use All Motion Mouse Tracking. P s = 1 0 0 4 → Don’t send FocusIn/FocusOut events. P s = 1 0 0 5 → Disable Extended Mouse Mode. P s = 1 0 3 4 → Don’t interpret "meta" key. (This disables the eightBitInput resource). P s = 1 0 3 5 → Disable special modifiers for Alt and NumLock keys. (This disables the numLock resource). P s = 1 0 3 6 → Don’t send ESC when Meta modifies a key. (This disables the metaSendsEscape resource). P s = 1 0 3 7 → Send VT220 Remove from the editing-keypad Delete key. P s = 1 0 3 9 → Don’t send ESC when Alt modifies a key. (This disables the altSendsEscape resource). P s = 1 0 4 0 → Do not keep selection when not highlighted. (This disables the keepSelection resource). P s = 1 0 4 1 → Use the PRIMARY selection. (This disables the selectToClipboard resource). P s = 1 0 4 2 → Disable Urgency window manager hint when Control-G is received. (This disables the bellIsUrgent resource). P s = 1 0 4 3 → Disable raising of the window when Control-G is received. (This disables the popOnBell resource). P s = 1 0 4 7 → Use Normal Screen Buffer, clearing screen first if in the Alternate Screen. (This may be disabled by the titeInhibit resource). P s = 1 0 4 8 → Restore cursor as in DECRC. (This may be disabled by the titeInhibit resource). P s = 1 0 4 9 → Use Normal Screen Buffer and restore cursor as in DECRC. (This may be disabled by the titeInhibit resource). This combines the effects of the 1 0 4 7 and 1 0 4 8 modes. Use this with terminfo-based applications rather than the 4 7 mode. P s = 1 0 5 0 → Reset terminfo/termcap function-key mode. P s = 1 0 6 1 → Reset keyboard emulation to Sun/PC style. P s = 0 → Normal (default). P s = 1 → Bold. P s = 4 → Underlined. P s = 5 → Blink (appears as Bold). P s = 7 → Inverse. P s = 8 → Invisible, i.e., hidden (VT300). P s = 2 2 → Normal (neither bold nor faint). P s = 2 4 → Not underlined. P s = 2 5 → Steady (not blinking). P s = 2 7 → Positive (not inverse). P s = 2 8 → Visible, i.e., not hidden (VT300). P s = 3 0 → Set foreground color to Black. P s = 3 1 → Set foreground color to Red. P s = 3 2 → Set foreground color to Green. P s = 3 3 → Set foreground color to Yellow. P s = 3 4 → Set foreground color to Blue. P s = 3 5 → Set foreground color to Magenta. P s = 3 6 → Set foreground color to Cyan. P s = 3 7 → Set foreground color to White. P s = 3 9 → Set foreground color to default (original). P s = 4 0 → Set background color to Black. P s = 4 1 → Set background color to Red. P s = 4 2 → Set background color to Green. P s = 4 3 → Set background color to Yellow. P s = 4 4 → Set background color to Blue. P s = 4 5 → Set background color to Magenta. P s = 4 6 → Set background color to Cyan. P s = 4 7 → Set background color to White. P s = 9 0 → Set foreground color to Black. P s = 9 1 → Set foreground color to Red. P s = 9 2 → Set foreground color to Green. P s = 9 3 → Set foreground color to Yellow. P s = 9 4 → Set foreground color to Blue. P s = 9 5 → Set foreground color to Magenta. P s = 9 6 → Set foreground color to Cyan. P s = 9 7 → Set foreground color to White. P s = 1 0 0 → Set background color to Black. P s = 1 0 1 → Set background color to Red. P s = 1 0 2 → Set background color to Green. P s = 1 0 3 → Set background color to Yellow. P s = 1 0 4 → Set background color to Blue. P s = 1 0 5 → Set background color to Magenta. P s = 1 0 6 → Set background color to Cyan. P s = 1 0 7 → Set background color to White. P s = 1 0 0 → Set foreground and background color to default. 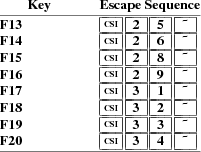 P s = 3 8 ; 5 ; P s → Set foreground color to the second P s .
P s = 4 8 ; 5 ; P s → Set background color to the second P s .
Set or reset resource-values used by xterm to decide whether to construct escape sequences holding information about the modifiers pressed with a given key. The first parameter identifies the resource to set/reset. The second parameter is the value to assign to the resource. If the second parameter is omitted, the resource is reset to its initial value. P s = 1 → modifyCursorKeys. P s = 2 → modifyFunctionKeys. P s = 4 → modifyOtherKeys. If no parameters are given, all resources are reset to their initial values. If the parameter is omitted, modifyFunctionKeys is disabled. When modifyFunctionKeys is disabled, xterm uses the modifier keys to make an extended sequence of functions rather than adding a parameter to each function key to denote the modifiers. Device Status Report (DSR, DEC-specific). P s = 1 5 → Report Printer status as CSI ? 1 0 n (ready). or CSI ? 1 1 n (not ready). P s = 2 5 → Report UDK status as CSI ? 2 0 n (unlocked) or CSI ? 2 1 n (locked). CSI ? 2 7 ; 1 ; 0 ; 0 n (North American). P s = 0 → never hide the pointer. P s = 1 → hide if the mouse tracking mode is not enabled. P s = 2 → always hide the pointer. If no parameter is given, xterm uses the default, which is 1 .
where P s is the mode number as in DECSET, P m is the mode value as in the ANSI DECRQM. P s = 6 1 → VT100. P s = 6 2 → VT200. P s = 6 3 → VT300. P s = 0 → 8-bit controls. P s = 1 → 7-bit controls (always set for VT100). P s = 2 → 8-bit controls. P s = 0 → Clear all LEDS (default). P s = 1 → Light Num Lock. P s = 2 → Light Caps Lock. P s = 3 → Light Scroll Lock. P s = 2 1 → Extinguish Num Lock. P s = 2 2 → Extinguish Caps Lock. P s = 2 3 → Extinguish Scroll Lock. Set cursor style (DECSCUSR, VT520). P s = 0 → blinking block. P s = 1 → blinking block (default). P s = 2 → steady block. P s = 3 → blinking underline. P s = 4 → steady underline. P s = 0 → DECSED and DECSEL can erase (default). P s = 1 → DECSED and DECSEL cannot erase. P s = 2 → DECSED and DECSEL can erase. Set Scrolling Region [top;bottom] (default = full size of window) (DECSTBM). Change Attributes in Rectangular Area (DECCARA), VT400 and up. P s denotes the SGR attributes to change: 0, 1, 4, 5, 7. P s = 4 ; height ; width → Resize the xterm window to given height and width in pixels. Omitted parameters reuse the current height or width. Zero parameters use the display’s height or width. P s = 8 ; height ; width → Resize the text area to given height and width in characters. Omitted parameters reuse the current height or width. Zero parameters use the display’s height or width. P s = 1 0 ; 0 → Undo full-screen mode. P s = 1 0 ; 1 → Change to full-screen. P s = 2 2 ; 0 → Save xterm icon and window title on stack. P s = 2 2 ; 1 → Save xterm icon title on stack. P s = 2 2 ; 2 → Save xterm window title on stack. P s = 2 3 ; 0 → Restore xterm icon and window title from stack. P s = 2 3 ; 1 → Restore xterm icon title from stack. P s = 2 3 ; 2 → Restore xterm window title from stack. P s >= 2 4 → Resize to P s lines (DECSLPP). Reverse Attributes in Rectangular Area (DECRARA), VT400 and up. P s denotes the attributes to reverse, i.e., 1, 4, 5, 7. Set one or more features of the title modes. Each parameter enables a single feature. P s = 0 → Set window/icon labels using hexadecimal. P s = 1 → Query window/icon labels using hexadecimal. P s = 2 → Set window/icon labels using UTF-8. Set warning-bell volume (DECSWBV, VT520). P s = 0 or 1 → off. P s = 2 , 3 or 4 → low. P s = 5 , 6 , 7 , or 8 → high. Set margin-bell volume (DECSMBV, VT520). P s = 1 → off. P s = 0 , 5 , 6 , 7 , or 8 → high. Copy Rectangular Area (DECCRA, VT400 and up). Enable Filter Rectangle (DECEFR), VT420 and up. P n = 1 ← no parity. P n = 1 ← eight bits. P n = 1 ← 2 8 transmit 38.4k baud. P n = 1 ← 2 8 receive 38.4k baud. P n = 1 ← clock multiplier. P n = 0 ← STP flags. P s = 0 → from start to end position, wrapped. P s = 1 → from start to end position, wrapped. Fill Rectangular Area (DECFRA), VT420 and up. P s = 0 → Locator disabled (default). P s = 1 → Locator enabled. P s = 2 → Locator enabled for one report, then disabled. P u = 0 ← or omitted → default to character cells. P u = 1 ← device physical pixels. P u = 2 ← character cells. Erase Rectangular Area (DECERA), VT400 and up. P s = 0 → only respond to explicit host requests (DECRQLP). (This is default). It also cancels any filter rectangle. P s = 1 → report button down transitions. P s = 2 → do not report button down transitions. P s = 3 → report button up transitions. P s = 4 → do not report button up transitions. Selective Erase Rectangular Area (DECSERA), VT400 and up. P s = 0 , 1 or omitted → transmit a single DECLRP locator report. P e = 0 → locator unavailable - no other parameters sent. P e = 1 → request - xterm received a DECRQLP. P e = 2 → left button down. P e = 3 → left button up. P e = 4 → middle button down. P e = 5 → middle button up. P e = 6 → right button down. P e = 7 → right button up. P e = 8 → M4 button down. P e = 9 → M4 button up. P e = 1 0 → locator outside filter rectangle. P b = 0 ← no buttons down. P b & 1 ← right button down. P b & 2 ← middle button down. P b & 4 ← left button down. P b & 8 ← M4 button down. Insert P s Column(s) (default = 1) (DECIC), VT420 and up. Delete P s Column(s) (default = 1) (DECDC), VT420 and up. P s = 0 → Change Icon Name and Window Title to P t .
P s = 1 → Change Icon Name to P t .
P s = 2 → Change Window Title to P t .
P s = 4 ; c ; spec → Change Color Number c to the color specified by spec. This can be a name or RGB specification as per XParseColor. Any number of c name pairs may be given. The color numbers correspond to the ANSI colors 0-7, their bright versions 8-15, and if supported, the remainder of the 88-color or 256-color table. P c = 0 ← resource colorBD (BOLD). P c = 1 ← resource colorUL (UNDERLINE). P c = 2 ← resource colorBL (BLINK). P c = 3 ← resource colorRV (REVERSE). The 10 colors (below) which may be set or queried using 1 0 through 1 9 are denoted dynamic colors, since the corresponding control sequences were the first means for setting xterm’s colors dynamically, i.e., after it was started. They are not the same as the ANSI colors. These controls may be disabled using the allowColorOps resource. At least one parameter is expected for P t . Each successive parameter changes the next color in the list. The value of P s tells the starting point in the list. The colors are specified by name or RGB specification as per XParseColor. P s = 1 0 → Change VT100 text foreground color to P t .
P s = 1 1 → Change VT100 text background color to P t .
P s = 1 2 → Change text cursor color to P t .
P s = 1 3 → Change mouse foreground color to P t .
P s = 1 4 → Change mouse background color to P t .
P s = 1 5 → Change Tektronix foreground color to P t .
P s = 1 6 → Change Tektronix background color to P t .
P s = 1 7 → Change highlight background color to P t .
P s = 1 8 → Change Tektronix cursor color to P t .
P s = 1 9 → Change highlight foreground color to P t .
P s = 4 6 → Change Log File to P t . (This is normally disabled by a compile-time option). P s = 5 0 → Set Font to P t . These controls may be disabled using the allowFontOps resource. If P t begins with a "#", index in the font menu, relative (if the next character is a plus or minus sign) or absolute. A number is expected but not required after the sign (the default is the current entry for relative, zero for absolute indexing). The same rule (plus or minus sign, optional number) is used when querying the font. The remainder of P t is ignored. A font can be specified after a "#" index expression, by adding a space and then the font specifier. If the "TrueType Fonts" menu entry is set (the renderFont resource), then this control sets/queries the faceName resource. P s = 5 1 (reserved for Emacs shell). The first, P c , may contain zero or more characters from the set c p s 0 1 2 3 4 5 6 7 . It is used to construct a list of selection parameters for clipboard, primary, select, or cut buffers 0 through 7 respectively, in the order given. If the parameter is empty, xterm uses s 0 , to specify the configurable primary/clipboard selection and cut buffer 0. If the second parameter is neither a base64 string nor ? , then the selection is cleared. P s = 1 0 4 ; c → Reset Color Number c. It is reset to the color specified by the corresponding X resource. Any number of c parameters may be given. These parameters correspond to the ANSI colors 0-7, their bright versions 8-15, and if supported, the remainder of the 88-color or 256-color table. If no parameters are given, the entire table will be reset. P s = 1 0 5 ; c → Reset Special Color Number c. It is reset to the color specified by the corresponding X resource. Any number of c parameters may be given. These parameters correspond to the special colors which can be set using an OSC 5 control (or by adding the maximum number of colors using an OSC 4 control). P s = 1 1 0 → Reset VT100 text foreground color. P s = 1 1 1 → Reset VT100 text background color. P s = 1 1 2 → Reset text cursor color. P s = 1 1 3 → Reset mouse foreground color. P s = 1 1 4 → Reset mouse background color. P s = 1 1 5 → Reset Tektronix foreground color. P s = 1 1 6 → Reset Tektronix background color. P s = 1 1 7 → Reset highlight color. P s = 1 1 8 → Reset Tektronix cursor color. - prefix a key with the ESC character. - shift the key from codes 0-127 to 128-255 by adding 128. X does not predefine NumLock (used for VT220 keyboards) or Alt (used as an extension for the Sun/PC keyboards) as modifiers. These keys are recognized as modifiers when enabled by the numLock resource, or by the "DECSET 1 0 3 5 " control sequence. The window- and icon-labels can be set or queried using control sequences. As a VT220-emulator, xterm "should" limit the character encoding for the corresponding strings to ISO-8859-1. Indeed, it used to be the case (and was documented) that window titles had to be ISO-8859-1. This is no longer the case. However, there are many applications which still assume that titles are set using ISO-8859-1. So that is the default behavior. If xterm is running with UTF-8 encoding, it is possible to use window- and icon-labels encoded using UTF-8. That is because the underlying X libraries (and many, but not all) window managers support this feature. The utf8Title X resource setting tells xterm to disable a reconversion of the title string back to ISO-8859-1, allowing the title strings to be interpreted as UTF-8. The same feature can be enabled using the title mode control sequence described in this summary. Separate from the ability to set the titles, xterm provides the ability to query the titles, returning them either in ISO-8859-1 or UTF-8. This choice is available only while xterm is using UTF-8 encoding. Finally, the characters sent to, or returned by a title control are less constrained than the rest of the control sequences. To make them more manageable (and constrained), for use in shell scripts, xterm has an optional feature which decodes the string from hexadecimal (for setting titles) or for encoding the title into hexadecimal when querying the value. The mouse protocols include DEC Locator mode, enabled by the DECELR CSI P s ; P s ’ z control sequence, and is not described here (control sequences are summarized above). The remaining five modes of the mouse protocols are each enabled (or disabled) by a different parameter in the "DECSET CSI ? P m h " or "DECRST CSI ? P m l " control sequence. Normally, parameters (such as pointer position and button number) for all mouse tracking escape sequences generated by xterm encode numeric parameters in a single character as value+32. For example, ! specifies the value 1. The upper left character position on the terminal is denoted as 1,1. This scheme dates back to X10, though the normal mouse-tracking (from X11) is more elaborate. X10 compatibility mode sends an escape sequence only on button press, encoding the location and the mouse button pressed. It is enabled by specifying parameter 9 to DECSET. On button press, xterm sends CSI M C b C x C y (6 characters). C x and C y are the x and y coordinates of the mouse when the button was pressed. Normal tracking mode sends an escape sequence on both button press and release. Modifier key (shift, ctrl, meta) information is also sent. It is enabled by specifying parameter 1000 to DECSET. On button press or release, xterm sends CSI M C b C x C y . The low two bits of C b encode button information: 0=MB1 pressed, 1=MB2 pressed, 2=MB3 pressed, 3=release. The next three bits encode the modifiers which were down when the button was pressed and are added together: 4=Shift, 8=Meta, 16=Control. Note however that the shift and control bits are normally unavailable because xterm uses the control modifier with mouse for popup menus, and the shift modifier is used in the default translations for button events. The Meta modifier recognized by xterm is the mod1 mask, and is not necessarily the "Meta" key (see xmodmap). C x and C y are the x and y coordinates of the mouse event, encoded as in X10 mode. Mouse highlight tracking notifies a program of a button press, receives a range of lines from the program, highlights the region covered by the mouse within that range until button release, and then sends the program the release coordinates. It is enabled by specifying parameter 1001 to DECSET. Highlighting is performed only for button 1, though other button events can be received. Warning: use of this mode requires a cooperating program or it will hang xterm. CSI t C x C y .
CSI T C x C y C x C y C x C y . The parameters are startx, starty, endx, endy, mousex, and mousey. startx, starty, endx, and endy give the starting and ending character positions of the region. mousex and mousey give the location of the mouse at button up, which may not be over a character. Button-event tracking is essentially the same as normal tracking, but xterm also reports button-motion events. Motion events are reported only if the mouse pointer has moved to a different character cell. It is enabled by specifying parameter 1002 to DECSET. On button press or release, xterm sends the same codes used by normal tracking mode. On button-motion events, xterm adds 32 to the event code (the third character, C b ). The other bits of the event code specify button and modifier keys as in normal mode. For example, motion into cell x,y with button 1 down is reported as CSI M @ C x C y . ( @ = 32 + 0 (button 1) + 32 (motion indicator) ). Similarly, motion with button 3 down is reported as CSI M B C x C y . ( B = 32 + 2 (button 3) + 32 (motion indicator) ). FocusIn/FocusOut can be combined with any of the mouse events since it uses a different protocol. When set, it causes xterm to send CSI I when the terminal gains focus, and CSI O when it loses focus. This enables UTF-8 encoding for C x and C y under all tracking modes, expanding the maximum encodable position from 223 to 2015. For positions less than 95, the resulting output is identical under both modes. Under extended mouse mode, positions greater than 95 generate "extra" bytes which will confuse applications which do not treat their input as a UTF-8 stream. Likewise, C b will be UTF-8 encoded, to reduce confusion with wheel mouse events. Under normal mouse mode, positions outside (160,94) result in byte pairs which can be interpreted as a single UTF-8 character; applications which do treat their input as UTF-8 will almost certainly be confused unless extended mouse mode is active. This scheme has the drawback that the encoded coordinates will not pass through luit unchanged, e.g., for locales using non-UTF-8 encoding. The normal mouse response is altered to use CSI < followed by semicolon-separated encoded button value, the C x and C y ordinates and a final character which is M for button press and m for button release. The encoded button value in this case does not add 32 since that was useful only in the X10 scheme for ensuring that the byte containing the button value is a printable code. The modifiers are encoded in the same way. A different final character is used for button release to resolve the X10 ambiguity regarding which button was released. The highlight tracking responses are also modified to an SGR-like format, using the same SGR-style scheme and button-encodings. The normal mouse response is altered to use CSI followed by semicolon-separated encoded button value, the C x and C y ordinates and final character M .
This uses the same button encoding as X10, but printing it as a decimal integer rather than as a single byte. However, CSI M can be mistaken for DL (delete lines), while the highlight tracking CSI T can be mistaken for SD (scroll down), and the Window manipulation controls. For these reasons, the 1015 control is not recommended; it is not an improvement over 1005. Line Feed or New Line (Ctrl-J). Form Feed or New Page (Ctrl-L). Switch to VT100 Mode ( ESC Ctrl-C). Return Terminal Status ( ESC Ctrl-E). PAGE (Clear Screen) ( ESC Ctrl-L). Begin 4015 APL mode ( ESC Ctrl-N). (This is ignored by xterm). End 4015 APL mode ( ESC Ctrl-O). (This is ignored by xterm). COPY (Save Tektronix Codes to file COPYyyyy-mm-dd.hh:mm:ss). ETB (end transmission block) is the same as Ctrl-W. Bypass Condition ( ESC Ctrl-X). GIN mode ( ESC Ctrl-Z). Special Point Plot Mode ( ESC Ctrl-\). Set Text Parameters of VT window. Normal Z Axis and Normal (solid) Vectors. Normal Z Axis and Dotted Line Vectors. Normal Z Axis and Dot-Dashed Vectors. Normal Z Axis and Short-Dashed Vectors. Normal Z Axis and Long-Dashed Vectors. Defocused Z Axis and Normal (solid) Vectors. Defocused Z Axis and Dotted Line Vectors. Defocused Z Axis and Dot-Dashed Vectors. Defocused Z Axis and Short-Dashed Vectors. Defocused Z Axis and Long-Dashed Vectors. Write-Thru Mode and Normal (solid) Vectors. Write-Thru Mode and Dotted Line Vectors. Write-Thru Mode and Dot-Dashed Vectors. Write-Thru Mode and Short-Dashed Vectors. Write-Thru Mode and Long-Dashed Vectors. → ESC / Z (‘‘I am a VT52.’’).